First make the crust by combining the flour, sugar, salt, oil & milk. Mix until well blended. Pat mixture in bottom and side of a 9″ pie pan. Do not roll out. (To smooth it out use the back of a hot metal spoon and gently push down to smooth evenly.) Set Aside. Filling: Combine sugar, flour, nutmeg and cinnamon. Toss lightly with sliced apples. Let sit 10 minutes for sugar mixture to melt onto the apples and then pour into the unbaked pie shell. Topping: Combine flour, butter, and sugar. Mix together with fingers or a fork, until crumbly. Sprinkle over pie. You’ll want to bake soon before the butter mixture softens too much. Place pie in brown paper bag and staple shut. Bake at 350 degrees for 1 1/2 hours. (If oven bakes hot, reduce to 325 degrees. No peeking.) Slit sack open with sharp knife. Cool easy apple pie on a cooling rack. 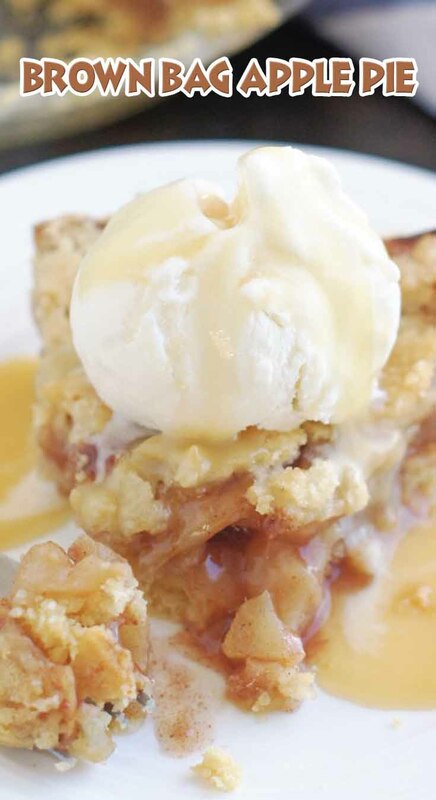 Serve apple crumble pie warm. Tastes great with vanilla ice cream and caramel on top.